It’s evident that Cadillac aims to print money with the new, smallish XT4 crossover, but that’s not because it’s going to be obnoxiously expensive. The car debuted at the New York Auto Show on Tuesday, and Cadillac says it’s starting out at a somewhat unexpectedly low price of $35,790. People want crossovers, and Cadillac wants to feed the addiction with a new five-door compact SUV that, the automaker truly hopes, will kickstart a reinvention of sorts. It’s Cadillac’s first foray into this sphere of luxury vehicles. 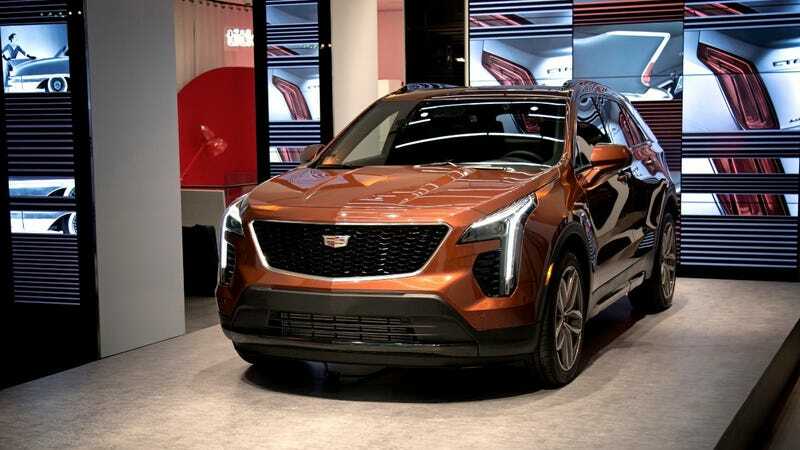 Starting at $35,740 (including destination charge) when it hits dealers later this fall, the XT4's coming with Cadillac’s 2.0L turbo engine and a nine-speed automatic transmission. It’s slightly smaller than the XT5, and gives Cadillac the chance to tap into the insatiable appetite for crossovers. A team of young designers representing the heart of the XT4’s target customer demographic helmed the design, penning an expressive SUV that injects a higher degree of sculpture into Cadillac’s lineup — and today’s vehicle is very close to their original visions for the exterior and interior. Looks like a damn minivan almost. That said, Cadillac said the interior’s offered in seven different “environments,” and there’s supposed to be plenty of space to stretch, with the automaker touting an expected top-tier amount of legroom, at 39.5 inches. There’s 4G LTE connectivity available, and a new controller for operations on the Cadillac CUE system on an 8-inch diagonal interface. Cadillac equipped the interior with wireless charging, which is always nice. Driving aids include surround vision and a rear camera mirror. Performance wise, the inline-four-cylinder engine that produces 237 hp at 5000 rpm and 258 lb ft of torque at 1500 rpm to 4000 rpm. How much power do you really need here? The car’s estimated to net a reasonable 30 mpg on the highway. One notable point is the introduction of an electro-hydraulic braking assist system that’s supposed to boost fuel economy and free up some space under the hood. Cadillac says it’ll take preorders starting this month from participating dealers, and the XT4 goes on sale in the fall.